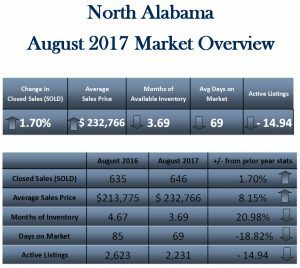 What is going on in our North Alabama real estate market? Today, I’m bringing you the latest update. The market numbers for this year’s August update are hot off the press. I want you to be the first to know about what’s been going on, so today I’m bringing you the latest information from our local real estate market. As we did last year, we’re again seeing a rise in sales and home values. Since 2016, inventory has remained steady. We’ve seen a 2% increase in home sales here in North Alabama from last year until now—with 646 homes sold. Compared to last year, we’ve also seen a rise in the average sales price. Going up by 8% from 2016, the average sales price now sits at a little over $232,000. The average list price has gone up by 7% as well—coming in just slightly over $237,000. On top of all of this, homes are also spending less time on the market. Currently, the average days on market is 69. This is a decrease of 19% from last year at this time. With just four months of available inventory, we are still definitely in a seller’s market. Demand is currently outpacing supply. This means that right now is still a great time to sell. You can find the full details for this market update on this chart.